But technology is like that. Sometimes things seem poised for greatness and disappear — bubble memory comes to mind. Sometimes things have a few years of success and get replaced by something better. Fax machines or floppy drives, for example. The Televox was a glimpse of what was to come, but not in any way that people imagined in 1941. What’s in a Name (or a Picture)? 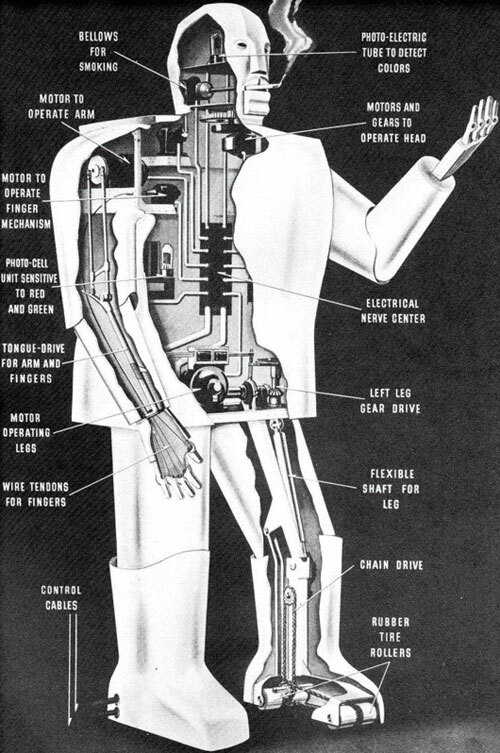 Demonstrations of Televox included a flat cartoonish-looking robot body. However, when traveling they sometimes wouldn’t ship the body and just cut a new one out of cardboard when they arrived. The photos of Televox looking like a bad Republic serial’s idea of a robot are pretty much press hype. A more interesting picture forms when you look at the name. The idea was that the “robot” was what we would call an embedded system that you operated via telephone, possibly with your voice. I say possibly because the control was crude. Typically, the input came from vibrating reeds tuned to particular frequencies. The output was also a series of tones you could hear over the phone. For the purposes of demonstrations, it was possible to find phrases that would vibrate the right reeds so it appeared you were giving voice commands. This reminded me of a kid’s toy 20 years later that accepted voice commands by sensing when you blew air out. The reeds are a bit more sophisticated, but only a little. In practice, you were more likely to blow on a pitch pipe to command Televox than try to do it with speech. The real secret behind the Televox wasn’t the cardboard human figure, but a new kind of tube from Westinghouse called a Knowles tube. These were later called grid glow tubes and were similar to thyratrons which would later replace them. The Knowles Tube, which is the heart of the televox, is somewhat similar to what the gaseous rectifier uses in radio, except that in addition to the anode and chathode there is a control grid. Alternating current potential is applied across the terminals of the anode and the cathode. The control grid, when free of outside influence, acquires a potential due to the space charge in the tube and blocks the passage of current between the anode and the cathode. However, when the [external] reed vibrates a connection is made to the grid which discharges it and the tube acts as a half-wave rectifier permitting the passage of a pulsating direct current which actuates a relay connected in circuit with the tube. So in short, the Knowles tube was allowed a ground connection to actuate a relay which could then do any number of things like drive a motor or turn on a light. Some Televox could even talk by way of an endless loop of movie film used only for sound. Have you ever played Googlewhack? That’s the game where you try to find a two word Google query that produces a single result. “Televox Knowles” isn’t quite a Googlewhack — it returns a bunch of results, but only the top two are relevant and they point to the same site: the Cybernetic Zoo. In the ordinary way you telephone your home. When your phone rings, Televox lifts the receiver and utters a combination of buzzes which tell you that you have the right number. Next you sound two short notes from the same pipe. These tell Telvox to connect you with the switch on the electric oven. This is the 1928 version of Amazon Echo or Google Home! There is more technical detail about grid glow tubes, though, and it doesn’t always match up exactly with the text in the Wonder book (which, admittedly, isn’t a technical reference). The cathode has a coating to improve emission. Voltage from cathode to anode causes current to flow and the gas within to ionize making a pinkish-green glow. A voltage on the grid can stop the flow of current if the current isn’t already flowing. Once the current flows, however, you have to lower the voltage to reset the tube to the off state. The grid glow tube didn’t last because the similar thyratron did a better job. It could handle much more current. They also employed filaments for emission so they didn’t start as fast and they consumed power even when switched off. Watching the video, it is hard to tell if Elektro picked up specific frequencies or just the number of utterances in a row. In other words, a three-word command must be “Elektro come here” even if it sounded like “Cat food sale.” The effect also includes the operator speaking to Elektro during a conversation without using the microphone. Elektro wasn’t listening, just running through a prerecorded pause. 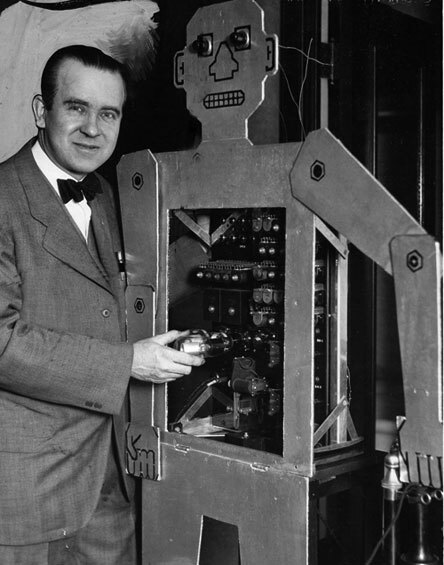 Elektro replaced his predecessor, Willie Vocalite who worked the 1932 fair. You have to wonder if Westinghouse really thought these were leading to something practical or if it was just more memorable to show a robot over a light bulb? If you subtract out the anthropomorphism, the Westinghouse prediction wasn’t bad. Most of us do have robots now that answer the phone, vacuum the floors, turn the lights on and off, While our robots typically don’t have legs and a head, they do have ears and respond — often correctly — to a spoken command. Perhaps Televox wasn’t such a bad prediction after all. The root idea — voice control of automated systems — has become largely practical in the last decade. When we talk about quantum computers, nanotechnology, and DNA manipulation, you have to wonder what will seem outdated in 100 years and what core ideas will continue to survive in some form or another.